Welcome to the Global PaedSurg Research Collaboration. We’re assembling the world’s largest prospective cohort study. Collaboration & participate in a multi- centre, international study on congenital anomalies. The research group, led by the Health Services Research Centre at the Royal College of Anaesthetists and the UCL Surgical Outcomes Research Centre, examined the factors associated with last minute cancellations. Their observational cohort study used data from 245 hospitals (more than 90% of NHS hospitals across England, Wales, Scotland, and Northern Ireland) during one week in March 2017. The course begins on the 23rd of April 2018, and is available in English and Spanish. Help us stop the spread of #AntibioticResistance. Quality heath care is equitable. This means that all people, regardless of their gender, race, ethnicity, geographical location or socioeconomic status, receive the good quality health care they need. Be good to each other everyone. Advocacy is at the heart of the G4 Alliance mission. We know that advocacy works, but we also know that it works best when we're all striving towards the same goal, led by the same vision and bearing the same message. 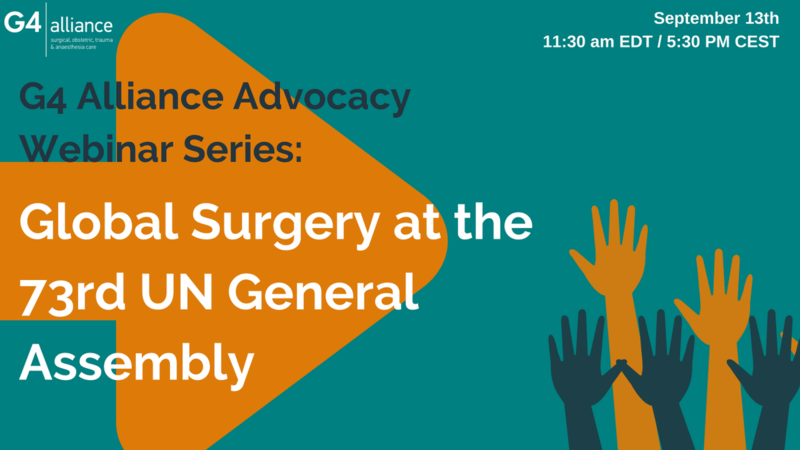 Together, we've raised the banner of surgery at the Universal Health Coverage Forum, UN High-Level Political Forum, the UN General Assembly, the World Health Assembly. We've brought surgery to events on maternal health, road traffic injuries, Universal Health Coverage and women's equality. Garnering support from policymakers and influencers is critical to the success of our mission, and the more people they hear about global surgery from, the better! As a G4 member, a partner, a global health stakeholder, or a passionate individual, you can join us in advocacy - in fact, we need YOU as an advocate to make a difference! This advocacy guide is intended to assist in advocating to policymakers and influencers at regional, national, and international global health events. Safe surgery, as each of these advocacy pieces emphasize, is a cross-cutting, cost-effective global health solution. Geneva, Switzerland; 20 June 2018 – The International Council of Nurses (ICN) today announced the launch of its Call for Abstracts for the ICN Congress 2019 in Singapore. With the theme, Beyond Healthcare to Health, the Congress will take place 27 June – 1 July 2019 at the Marina Bay Sands Expo and Convention Centre. The on-line submission system will be open from 1 September to 31 October 2018. ICN’s Congresses are the world’s largest international events for nurses. Registration for the 2019 Congress in Singapore will open on 1 September 2018. Miss Phyllis Mary DAVIS, Charlestown NSW 2290 For significant service to nursing through clinical, administrative and international advisory roles, and to nurse education. Service includes: New South Wales Health, South Eastern Sydney Local Health District: Nurse Manager, Randwick Campus Operating Suite, since 1997. Responsible for management of the Perioperative Services at the: Prince of Wales Hospital, Sydney Children's Hospital and the Royal Hospital for Women. Member, Workforce Planning Committee, since 2007. Representative (Perioperative Nurses), Surgical Service Taskforce, since 2005. Seconded Project Co-ordinator, Enrolled Nurses Perioperative Project, Nursing and Midwifery Office, 2005-2006. Member, Infection Control Advisory Committee, 1997-2002. Australian College of Perioperative Nurses: President, 2000-2002; Fellow, 2006. Founding Mentor, PNG Perioperative Nurses Society, 2004. President, 2000-2002. Ambassador, International Federation of Perioperative Nurses (IFPN), on-going. New South Wales Operating Theatre Association: President, 1996. Vice-President, 1995. Conference Convenor, 1996. Former Zone Co-ordinator. Former Executive Committee Member. Life Member, 2012. Member, Australian College of Nursing (formerly known as College of Nursing), since 1992. Panel Member, 'Review of operating suite' in Pambula, Tamworth, Harden, Mt Druitt, Hornsby, Kempsey and Coffs Harbour Hospitals. Member, Ministerial Advisory Committee, Private Hospitals and Day Procedure Centres, 1997-2000. Member, Perioperative Workforce Review, Tasmanian Department of Health. Member, New South Wales Supply Contract Management Committee,1995-1999. Registered Nurse, since 1980. Geneva, Switzerland, 28 May 2017 – The International Council of Nurses (ICN) delivered a number of interventions on key agenda items at the 71st World Health Assembly (WHA) which kicked off 21 May 2018 in Geneva. With thehttp://www.wfsablog.org/patient-safety-in-the-perioperative-environment-an-interview-with-mona-guckian-fisher SAFE-T Summit fast approaching, the WFSA are interviewing some of our speakers as part of our SAFE-T Summit blog series to learn more about their contributions to global surgery and anaesthesia safety. Looking to Start a Nursing Organization? We Can Help! Are you thinking of creating a nursing organization in your area? IFPN is here to assist you! Please take a look at our start-up guide to get yourself going, then contact us for more assistance.